This is the first of a short series of articles looking at some elements of book front and back matter i.e. what comes before chapter 1 and what follows after the story has ended. Note 1: The majority of visitors to this website have an interest in memoir and fiction consequently the following discussion will primarily centre on such genre though there will be the occasional reference to non-fiction. Note 2: This series came about because it was noted, from various comments and observations, principally in social media discussions, there appeared to be a lot of confusion about the differences between some elements of book front and back matter. Regular readers will know a number of surveys were subsequently conduct. The results have shown there is indeed confusion in some quarters. As indicated by the above definitions and others that may be found, a preface is in effect an introduction. However, within the publishing industry ‘Preface’ is the recognised and primary term when it comes to autobiography, biography, memoir and fiction. Naturally, it could also be utilised for non-fiction though there are those who consider ‘Introduction’ the more appropriate term for them. There is a school of thought that thinks readers are more likely to read an introduction as apposed to a preface because the latter is seen as boringly highbrow. It has to be acknowledged this may be true with some modern readers. Nevertheless, it would probably only add to the confusion if authors constantly interchanged the terms. The fact there is confusion is exemplified by one respondent to a survey, that asked where certain information should be included, stating they could not complete it because the choices offered did not include ‘Introduction’: Preface was listed as an option. Of course this may all be academic: many readers admit to skipping all front matter and going straight in at Chapter 1. It should also be noted not all books require a preface. In the end, as with other aspects of the writing process, it is down to the individual author to decide. Preface: Written by the author with information relevant to the book and themselves (where appropriate) as outlined below. Forward: Written by a third party in support of the author and their work. These are usually by someone with a known name who consequently lends credibility to the author and their book. As already mentioned, it is not necessary to included a preface in every book. The determining factor is whether there is anything to add that informs and helps the reader. What to include in a preface may be as varied and unique as the individual writing it. The following suggestions have been compiled from a variety of published thoughts and ideas available on the internet and from the writer’s own experience. One important point to keep in mind: the preface should be as concise as possible. Readers may, rightly, become irritated if it is not as it is only supposed to be a brief introduction to the book. To try and help authors determine what is right for them, some observations have been added in italics. Bear in mind, the following are only suggestions. There are no hard and fast rules. How book came about: Why the author wrote it. Why they chose the subject. What was their motivation/inspiration. Description of characters and theme(s): Designed to build interest (hook) so reader will continue. Should be brief and not give too much away. Alternatively author may prefer to leave such information for the synopsis and/or prologue (more about prologues in a subsequent article). Purpose: This is especially relevant for non-fiction. However, it may sometimes be appropriate for other genre e.g. Part of T. R. Robinson’s purpose for her memoirs is, hopefully, to help others who are going through or have been through similar circumstances. Benefits for reader: What will the reader gain from the book. What may they expect. This may be as simple as ‘have a laugh’, ‘learn what it is to survive abuse’, etc. Author’s Journey: What they learnt in the writing. What difficulties they faced. Whether the writing has changed them. How long it took to write (May be important e.g. with biography of famous person). Etc. Research: Obviously mostly applies to non-fiction though some fiction may also require the author to research a topic. 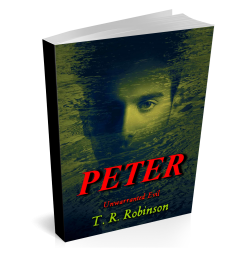 Alternative to including such information here is for the author to utilise an appendix such as T. R. Robinson has for the novel ‘Peter’ within which numerous medical conditions are encountered. Acknowledgments: Thanking those people; editor, friends, fellow authors, family, etc. who helped with the writing, proofreading, publishing, etc. processes. With modern publishing, especially with the advent of digital (e-book) editions and the ‘Look inside’ (sample) feature, acknowledgments now tend to be added as a separate section in the ‘back matter’. Even when included in front matter acknowledgments tend to be separated from the preface. How to read: If appropriate (where there are special features) suggestions on how the book should be read. Why this book: Again, if appropriate, what makes the book different to similar ones. Why the reader should choose it in preference to others. Why author right person to write: What makes the author qualified to write the book. Will primarily apply to non-fiction though it could also apply to fiction if it deals with, or is based upon, something unique. New Edition: This is the place to explain reason for a new edition. Language: Clear statement of language, or version of a language, the book is written in. A reader once criticised a book for being full of spelling errors. Turned out the lady was American, where phonetic spelling is used, but the book had been written in British English. Disclaimer: Authors need to protect themselves against accusations of error, misrepresentation or wrong doing. For example: In most of her books T. R. Robinson unequivocally represents the horrors and cruelty of participants. However, though some are deserving of it, she has no wish for them or their relatives and friends to suffer because of it. Names have therefore been either omitted or changed. No doubt readers of this article will be able to think of other information that could be included. Considering the principles of conciseness and relevance, the list of possibilities given above is rather long. Many suggest part of a preface’s purpose is to provide readers with some insight into who the author is as an individual. Not everyone will agree but even if they do it should be noted, with modern publishing ethos, there are alternatives to the preface for such information e.g. ‘About the Author’; ‘Also by the Author’; ‘Author Pages’ (in publishing sites and social media accounts); ‘About Pages’ (by linking to them in website; blog; or social media accounts). It is not proposed to discuss these elements further here beside which they are reasonably self-explanatory. Naturally, in the end, what and what not to include is down to the individual but they should be influenced by the principles of relevance and conciseness. As mentioned this series of articles has been motivated by the fact confusion, as to what some elements of book front and back matter should incorporate, exists. Regrettably this is not limited to readers: many authors appear to be just as confused. Survey results suggest, with some points, the confusion could be as high as fifty percent. To clarify: A preface is primarily intended to be an introduction to the book, not the story though some small elements of it may come through. It is crucial the principles of conciseness and relevance are constantly born in mind. The original intention was to provide one all encompassing article however, there are a number of different aspects to consider meaning the resulting article would have been far too long. The next in the series will consider Prologues. Apologies for only using T. R. Robinson examples but it was not considered fair to use other authors works for the purpose. Google Plus (G+) Closing – Are you ready? This is superb, Tanya! Will share on twitter and facebook. I’ve written a preface for my memoir/guide, calling it an introduction for now. I had to do this first before anything else because it will help me stay on track. Many of the points you’ve mentioned above wove in naturally and now i have a useful guide from you. I learned about prefaces with the OU for life writing genres, but you have gone into far more detail. Brilliant! Thank you Lynne. Grateful you find my meanderings helpful. Appreciate you letting me know.